May I introduce… The Virgo Family. We are a triangle of 3, consisting of Mum Carla Ann, Dad Sven Christian Peter and little Tallulah Lola. We consider ourselves Universal Global Citizens, spiritual seekers, as well as eternal students in this great university called life. Both, Carla & Sven have always lived an international Lifestyle. Carla was born and raised in London and Sven in the hinterland of Southern Germany (Black Forrest.) Back in 2013 our paths finally crossed, in the middle of the dessert of the Kimberlys, Western Australia. This was just after Sven finished his South East Asia Trip, and had followed the intention to travel Down Under, to participate in some WWOOFing (Willing Working on Organic Farms). He ended up looking after the Veggie Garden, of a remote resort’s restaurant, named ECO Beach. Carla was managing the SPA and Yoga Studio at that time offering Yoga, Massages, as well as her Healing Modality Life Alignment. From there, our romance and common life's journey unfolded. We continued to live and work at Eco Beach. This was followed by a change of location and jobs, with an unlucky attempt to settle in Australia for good, as a result. Reconsidering our options we choose to surrender to this fate, and followed our wish to participate in a Ceremony of Love, which turned out to be our traditional Hindu Wedding in Alappuzha, India, at the beginning of the year 2015. After a brief visit to our family in Europe, we participated at a 21 day silent Yoga Retreat at the ISHA Ashram, amongst the idyllic mountain ranges of the Velliangiri Mountains in Coimbatore, Tamil Nadu, India. The initial intended 21 days turned into 8 months, which we choose to spent living a humble monk’s life in the Ashram. 6 months of which Sven completed the intensive 1700 hour ISHA Hatha Yoga Teacher Training. 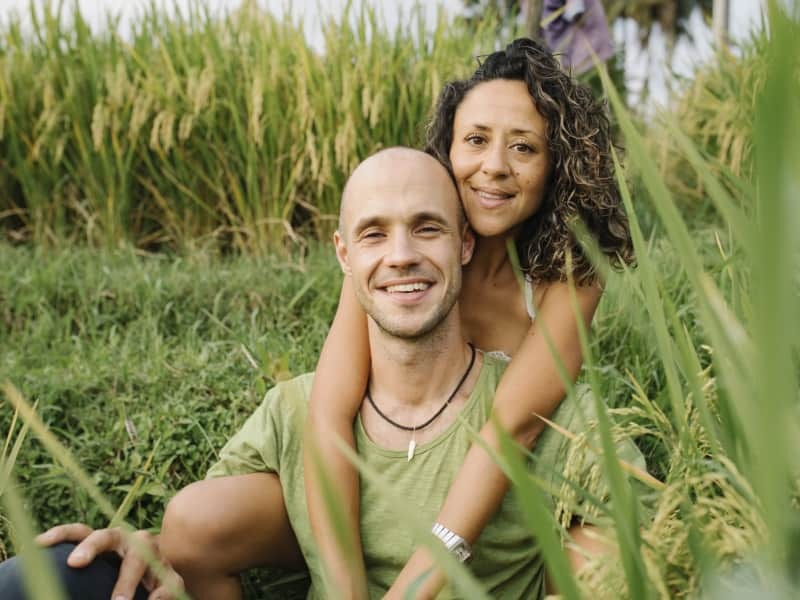 While Carla occupied most of her time serving the Ashram in the form of Seva (Selfless Service and Volunteering) as well as commuting between the ashram and Bangalore to teach yoga classes. After 8 months in the Ashram, Carla and I kept travelling through this magnificent country India for another half a year. Then it was time to pay another visit to family and friends in Germany, Switzerland and the UK. For the following 7 months we lived in London where Sven taught classes for his former fellow ISHA colleague, who just started his own yoga studio. At Christmas Eve 2016 we received our expected positive pregnancy test result and decided to move into a tiny treehouse, built on eco-community land, located at the heart of the Abel Tasman National Park, in New Zealand. Our motive, moving to this completely foreign country, which neither of us had ever visited, was our intention to bring our child into the world according to our wishes alone. Far Far away from expectations, opinions and ideas, to be able to fully concentrate on our individual journey into parenthood. Our Daughter Tallulah was born, one day before Sven’s birthday, on the 29th of August 2017, and 3 days before Carla’s… and our world hasn't been the same ever since. For the past 8 months we have called the beautiful island of Bali, Indonesia our home, where Sven took on the role of a full-time-stay-at-home-dad. This enabled Carla to grow her expertise, mainly by working with, and empowering women, with the therapeutic bodywork modality Self:Cervix. Parallel to this, she followed her passion serving a pregnant lady as a doula. In the meanwhile Sven was enjoying the precious family time, bonding with little Tallulah, while practicing his passion of fermenting Kimchi, Sauerkraut, Coconut Yoghurt and Kombucha, as well as being a wholehearted chef. At the end of 2018, Sven participated in a groundbreaking workshop with BBTRS (Biodynamic Breathwork & Trauma Release System) ( https://www.biodynamicbreath.com ) which led him into dedicating and studying this powerful Breathwork Modality ever since. Looking back, by the end of the time we have left New Zealand, and the end of the year in Bali, we had successfully participated in 2 long term Housesitting experiences (you’ll find further details in „Our Experience“ section of our profile). But before that, we have been also staying in many homes, of our international circle of friends, for shorter periods. Carla Ann has gathered a lot of experience in the Holistic world serving as a Life Counsellor, Doula, Massage Therapist and Bodyworker (Self:Cervix Practitioner) and is also trained in many other holistic modalities including YIN Yoga and Life Alignment. Sven is passionate about his Breath-and Bodywork and is envisioning to run workshops, in New Zealand, Australia, Bali and Germany in the future, while offering and teaching this therapy to as many people as possible. 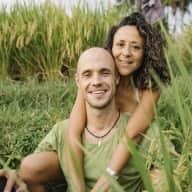 Our common Vision is to merge our personal expertise in Self Development, which we have gathered through our life experience, while travelling the world over the past few years, meeting and connecting with people from all walks of life, and participating in a variety of workshops, trainings and holistic therapys. We now feel ready to share this work, with as many people as possible, while being settled in New Zealand down the track, co-creating a center of Wellbeing, Self-Exploration and personal Empowerment (you’ll find further details of our vision in „Our Experience“ section of our profile) and also offering Workshops in Bali, Australia and Germany. We are also in the process of creating an online-platform for young parents like ourselves, offering ways in reconnecting and maintaining intimacy in the first challenging years of parenthood. Generally speaking, we are people to get along with very effortlessly. We love to connect from the heart. Practices like Non Violent Communication and Heart Sharing Circles for Men and Women within our community, are our regular practice. We value our spiritual development as much as our material wellbeing, and maintain the former through regular meditation, Affirmation, Prayer, and exercise like Yoga, Kundalini, Tantra, Pranayam, Music and Dance. Tallulah has been growing up in very close contact to us, co-sleeping with us every night. She is uncomplicated and surprisingly independent for her young age. She usually lights up everybody’s heart and mind when she is around, even people who prefer to avoid lively contact with children. Especially being a young (Virgo)Family of 3, looking after someone else's home enables us to receive that "Home Sweet Home Feeling", wherever we are, and provides a sense of safety and belonging for the time being. we figure that housesitting equally is a great way to connect to local people (and pets), in order to have a true local experience. Since we have lived an internationally Lifestyle for many years now, we came to realize, that in order to have an in depth experience of local culture, it is vital to be settled for a good amount of time at only one place, instead of changing locations regularly. That way you avoid the unpleasant effects of Travel Fatigue and really get to know people with their customs and local cuisine as well as the indigenous wildlife with it's flora and fauna. Our dear friend Ann offered us to look after this little gem of a Homestay, for the time being on family vacation in Australia. For the months of March and April last year, we were also involved housesitting the gorgeous Kaitawa Retreat Centre, at the foothills of the Tararua Ranges on the Kāpiti Coast, New Zealand. The people behind this magical sanctuary for healing and transformation are Anna and Rob. Our closest friends and valued guides and mentors. Our vision includes to live in a tiny house on their land one day, and to co-create a conscious healing community with them, offering our work as a contribution. For the rest of our time we were staying in Rob and Anna's cabin amongst the gumtree woods, while they were travelling and later moved into the Sleep Out next to their home. We enjoyed cooking and eating together, as well as partaking in extensive hikes in the near National Park. I live in Bali in my homestay, Shady Grove Healing Centre in Sanur. I work as a spiritual healer and counsellor and invite only guests who are happy to meditate twice daily and live clean ( free 24 hours of each days stay, from coffee, cigarettes, alcohol and pharmaceuticals ). Sven, Carla and Talullah came to stay with me, as my guests and as I had been planning to come to Australia for three months, when I met them, I knew they would be perfect housesitters. Unexpectedly my father fell ill and I had to leave early and I felt assured that they would be great in my place. In my absence over the month of December '18 and January 2019 Carla and Sven earned themselves a very fine reputation, as hosts to my guests, because they took excellent care of my home, my guests and my staff and my pets, always with a loving heart.. They managed to overcome a number of challenges, during that time, including general and unexpected building maintenance, as well as a surprise invasion of hornets. Their communication skills are clear and easy and therefore I would highly recommend them as housesitters. Not only are Carla and Sven mature and sensible, but responsible and beautiful heartfelt souls of the highest integrity. I have added them to my family and wish them the greatest of good fortune always. Carla and Sven are incredibly trustworthy, honest people. We felt completely at ease during our holiday, knowing that our house, cat, garden and sheep were all looked after with care. Their daughter is so relaxed, happy and divine. We highly recommend them to anyone wanting a loving and trustworthy couple to housesit. They both have experience managing retreat centers and as facilitators, and are fabulous at organizing staff and services.